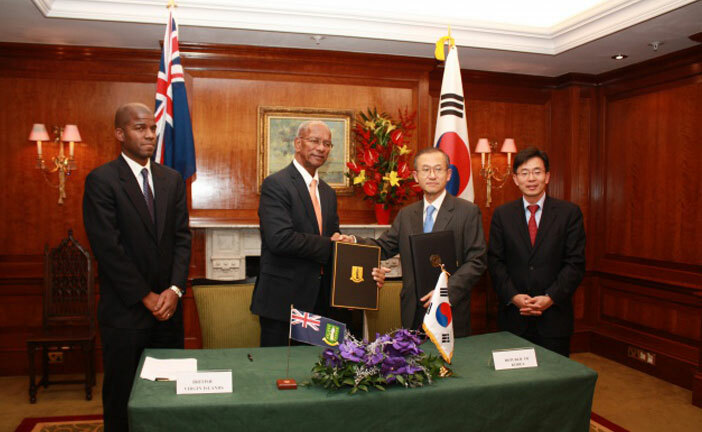 The Government of the Virgin Islands has taken further steps in strengthening its international relations by signing a Tax Information Exchange Agreement (TIEA) with the Government of South Korea. 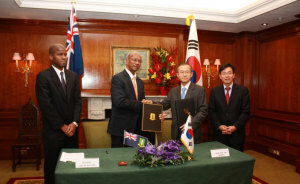 Premier and Minister of Finance of the British Virgin Islands (BVI) Dr. the Honourable D. Orlando Smith, OBE, signed the agreement with South Korea’s Ambassador to the United Kingdom, His Excellency Sungnam Lim, who signed on behalf of South Korea. The event took place on Friday December 5 at BVI House in London. The TIEA is based on a model agreement developed by the Organisation for Economic Cooperation and Development (OECD). It will allow exchange of information by request on criminal and other tax matters in accordance with the procedures agreed. The BVI has long been active in international efforts in the fight against financial crimes and is committed to develop and comply with the international standards on money laundering, terrorist financing and financial regulations. According to the Premier and Minister of Finance, the BVI’s cooperation in fostering these international standards enhances its reputation as a world class, globally integrated and responsible financial centre. In April 2002, the British Virgin Islands made a commitment to work with the OECD to develop principles of transparency and exchange of information in tax matters. Inclusive of this recently signed agreement, the BVI has signed 27 TIEAs to date with Ireland, the Kingdom of the Netherlands, Curacao, St Maarten and Aruba, the United States, the United Kingdom, Australia, New Zealand, France and the Nordic Alliance of Sweden, Norway, Finland, Denmark, Iceland, The Faroes and Greenland and China, India, Germany, Poland, Portugal, the Czech Republic, the States of Guernsey, Canada, Japan and now South Korea.